England's final competitive match before the World Cup ended in a crushing 112-run defeat by Australia in the final of the one-day international tri-series in Perth. So this much is clear - with only two warm-up matches before the two teams meet again for their World Cup opener in Melbourne on 14 February, England still have plenty to work on. With the help of Test Match Special's Charlie Dagnall, who watched every England match in the tri-series, BBC Sport looks at what is right with England, what is wrong and how the problems might be tackled. England spent three-and-a-half years preparing for the World Cup with Alastair Cook as skipper, so the decision to jettison him and replace him with Eoin Morgan, whose form was hardly stellar in 2014, was not without its risks. Morgan's form dipped during the last calendar year, when he averaged just 25.45 with the bat in one-day internationals and scored just one century in 22 innings. However, the Middlesex left-hander hit a hundred in his first game in charge to silence the naysayers. And while his form with the bat has waned since then, his captaincy has been both forthright and imaginative. Charlie Dagnall: "Alastair Cook was the elephant in the room. He was struggling with the bat and everyone else kept being asked about him. His removal relaxed the team and they've all seemed in pretty good spirits and content. The camp seems like it's been freshened up with Morgan in charge. "Getting runs in the first match helped, it meant everybody could relax. And he has had a very good series as a captain. His chopping and changing of bowlers has been inspired at times and his field placings have largely been good." England have now lost 13 of their last 15 one-day internationals against Australia in Australia, including the thumping in the tri-series final at the Waca. But, lest anyone forgets, this is a very useful Australian outfit. Brimming with attacking batsmen and pace in abundance, Australia will be very difficult to beat on home soil and are deserving of their status as tournament favourites. CD: "The defeat in the final will have dented England's confidence. The spectre of Mitchell Johnson (who took 3-27 on his return to international duty) still looms large. But it's not all doom and gloom, there are encouraging signs. "There have been some fine individual moments - Morgan's hundred in Sydney, Ian Bell's hundred in Hobart and two match-winning knocks by James Taylor. "And every bowler has had his moments. England got smashed by a fine Australia team - but Morgan will be quietly happy, all things considered." The accepted wisdom was that Bell's style was being compromised with Cook as his opening partner. With Cook invariably playing the anchor role, Bell was compelled to play a more risky brand of cricket than he might usually do. But with Cook discarded and Moeen Ali now his opening partner, Bell scored 51 and 187 in England's tri-series warm-ups, an unbeaten 88 against India in Brisbane and 141 against Australia in Hobart. CD: "One of the biggest success stories has been Ian Bell, who can now play his own way because he's got a dasher alongside him. Now Bell doesn't feel he has to play an enforcing role, we're seeing the best of him." Ravi Bopara is nominally an all-rounder in limited overs cricket but he bowled only three overs in five matches during the tri-series and contributed only 57 runs in England's middle order. So if Morgan does not trust Bopara with the ball and Bopara is struggling with the bat, is it time to drop him from the team? England have alternatives. Moeen has also struggled for runs at the top of the order but has sent down some quality off-spin, meaning his place in the team is cemented. But one option would be to drop Bopara, move Moeen down the order and select Alex Hales to open instead. Or drop Bopara, move Jos Buttler up the order and toughen up the middle order with Gary Ballance. 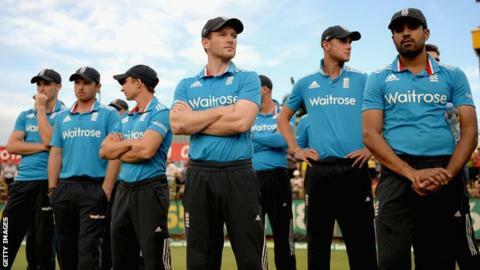 CD: "I'd be amazed if the England XI does change for the opening game at the MCG against Australia. It would be a bold move to cast Bopara aside now, because of the bowling option he gives you." Bowling at the business end of an innings is a one of the darkest arts in cricket - and on the evidence of the tri-series, most of England's seamers are still too innocent. At the Waca on Friday, India number 11 Mohammed Shami plundered 25 runs from 18 balls; at the same ground on Sunday, James Faulkner smashed 50 from 24 balls, with Chris Woakes taking a fearful clattering. CD: "James Anderson has been far and away England's best seamer on show; Steven Finn has looked like his old self, minus 5mph of pace; Stuart Broad is improving; Woakes has been up and down - he had a terrible game in the final but took 4-40 against Australia in Sydney. "But none of England's seamers play as much Twenty20 cricket as the Australians, Indians, Sri Lankans and Kiwis, so they don't have as much experience of death bowling. I'm not sure they have set plans, they seem to be making it up as they go along." James Tredwell has been one of England's most consistent bowlers over the last few years and bowled well in England's tri-series warm-up games. However, most Australian pitches are not conducive to off-spin, meaning the Kent man is likely to spend an awful lot of time during the World Cup fetching drinks. Moeen's performances with the ball mean the England selectors can ape Australia's preferred line-up - four seamers backed up by a spinner who is primarily in the team for his batting, in Australia's case Glenn Maxwell. CD: "Tredwell will feel aggrieved but Moeen has bowled brilliantly and this is Australia, where pace rules. And if Australia don't feel the need to pick a front-line spinner and rely on four seamers instead, that's clearly the way to go."